The area formerly known as Rum Jungle, remembered in folklore as the place where teamsters carrying supplies to the goldfields overturned a load of rum and stopped to consume it, was renamed Batchelor in 1912. It was then a government ”demonstration farm”. During WWII Batchelor Aerodrome was used by both Australian and US defence forces and substantial building took place in the area at that time. However the shady tree-lined town seen today was developed to accommodate the workers at Rum Jungle Mine, Australia’s first uranium mine which operated between 1953 and 1971. 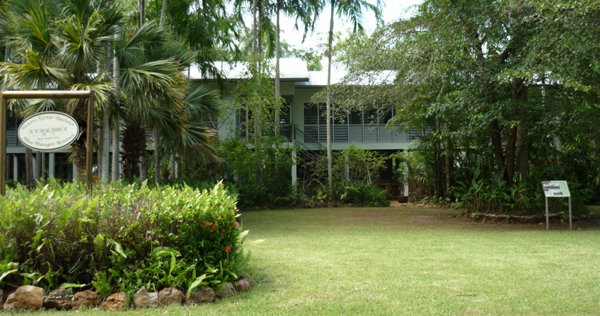 Today Batchelor which is located on the doorstep of Litchfield National Park houses the Batchelor Institute of Indigenous Tertiary Education, a vibrant town community, a busy airport and tourist accommodation and activities. The former Mine Managers Residence was the “boss’s” accommodation, built in the traditional elevated style for the tropics with lots of louvres to catch the breeze. Even though it was a large house to begin with, it was extended to accommodate the wide range of visitors including the Duke of Edinburgh and Robert Menzies, the then Prime Minister.